You are currently browsing the tag archive for the ‘Superman building’ tag. Paul Harvey (radio host from 1952-2008) used to have this radio bit titled “The Rest of the Story.” I am reminded of that title when I think of how some people and places in my life have a story for me that lasts decades, and I expect future decades of story to be added. There is an added richness to my experience when I consider not only today, but also the rest of the story. 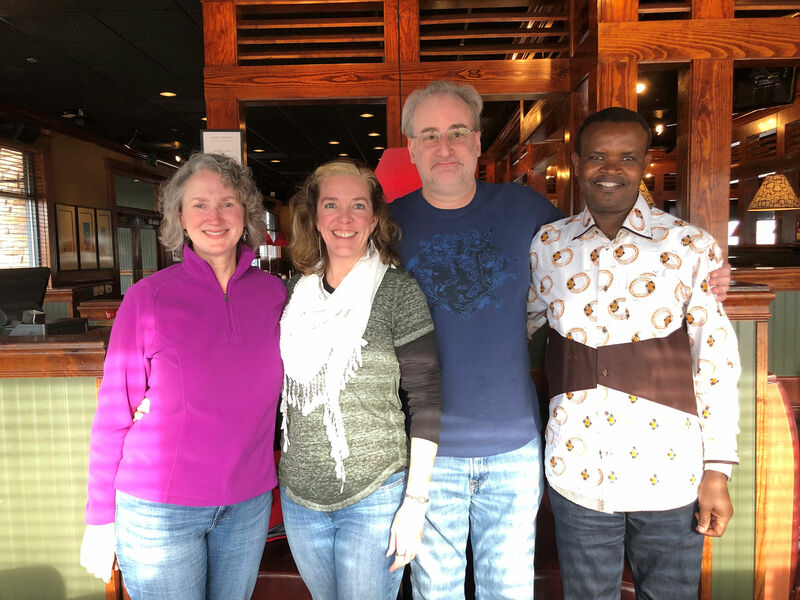 My trip to Rhode Island was a great opportunity to meet up with old friends. States are tiny on the northeast coast, so visiting state to state is like driving to another town. Kim, Will, and I used to work together at the National Weather Service in Burlington, Vermont in 1995-1998. They knew me when I was pregnant with Tara, and got to meet baby Tara in the first weeks of their life. Tara and I went to Kimberly’s wedding. Kim still works for the National Weather Service in Massachusetts. Will still forecasts for Vermont, though he lives in Rhode Island. Romain is a Catholic priest, and was a classmate at Brandeis University and became one of my best friends at school in 2005-07. Tara and I last saw Romain when he gave us a tour of the Harvard College campus back when Tara was deciding what college to attend. These friends weave through my life. We met for lunch at a place in between all three of us, in Taunton, MA. We chatted for two and a half hours, but finally Kim had to go to work. It was so easy to get comfortable with them all despite not having seen any of them for years, and I was happy that Will and Kim and Romain easily enjoyed each others’ company though meeting for the first time. 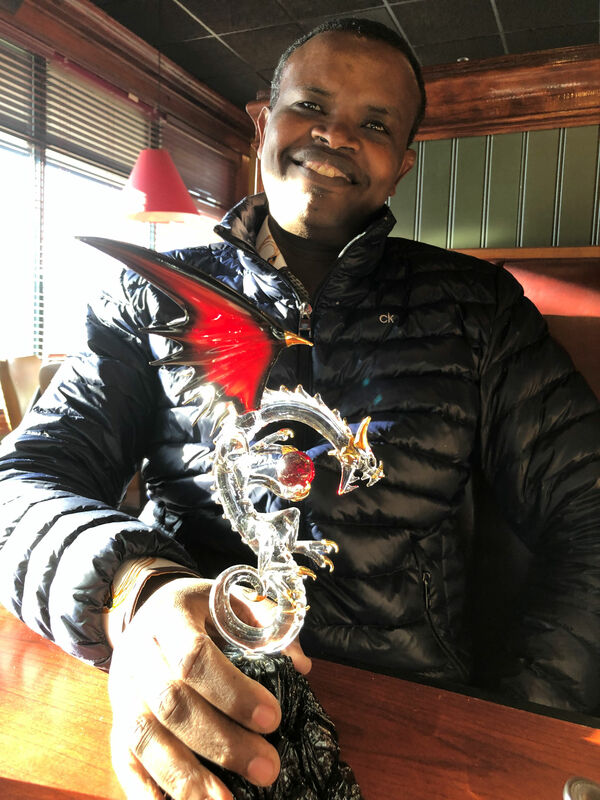 Before Romain left he gave me a stunning birthday gift of a glass dragon for the Dragon Lady. The next morning I had to leave Rhode Island. It dawned that spectacular blue that only happens in New England winter skies, and I had Will hold the car while I finally got a great shot of the Superman Building, Providence’s tallest skyscraper. Will told me that locals call it that because it reminds them of the Daily Planet building in Superman comics. You know, the newspaper where Clark Kent worked. 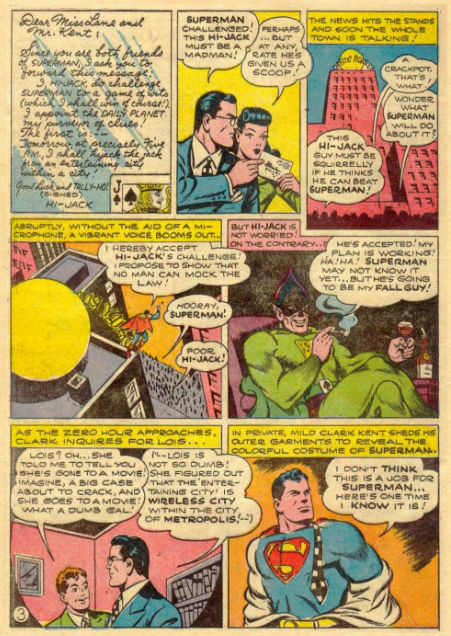 Being a nerdy girl myself, the idea of a comic book connection was intriguing and I looked up images of the Daily Planet. 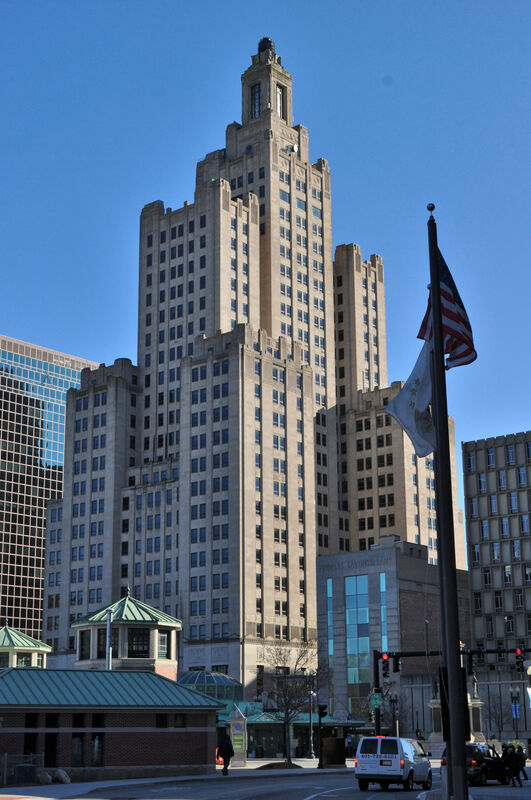 I think the residents of Providence are generous in their memories, because the building really doesn’t look anything like what I found online. However!! 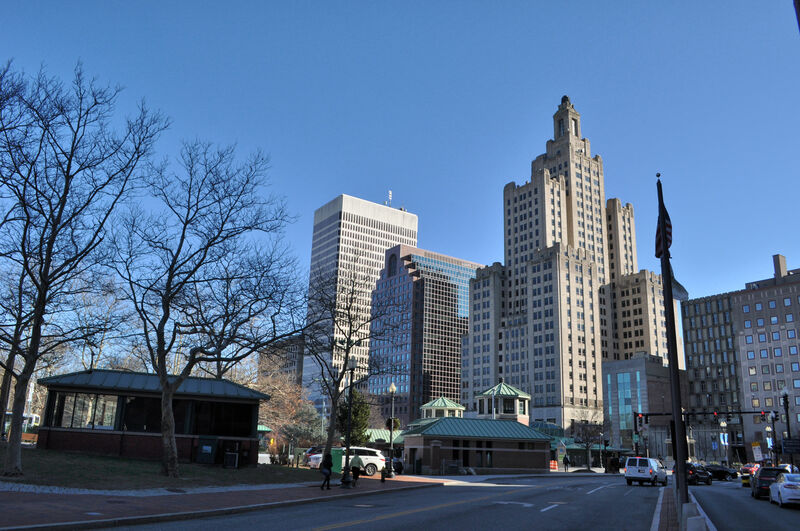 I’m not a connoisseur of comics, particularly not DC, so there might have been a series or an artist that drew the building more like the Providence building. You be the judge. 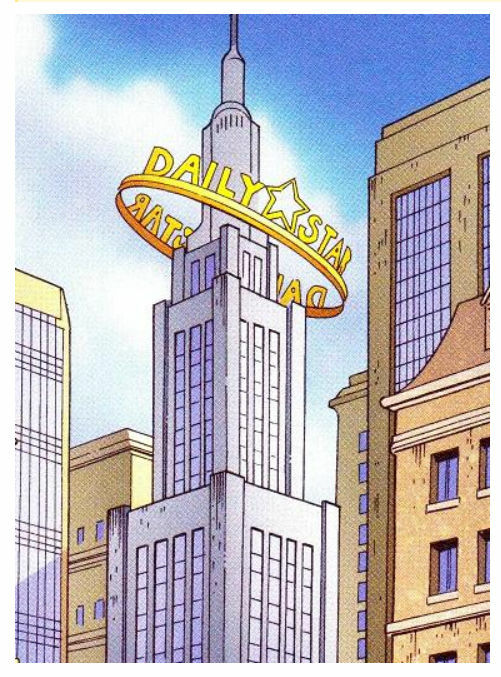 Now THIS image of the Daily Star building (from an early version of the comic in 1938 before the name was changed to Daily Planet), looks a lot like the Providence building. An image of the Daily Planet building from 1943. There is no denying that it’s a stunning building. It’s gorgeous and I love it. The 26-story building opened in 1928. I was dismayed to find out that it has been empty for over 5 years and has such a low real estate value placed on it that there are calls for it to be demolished. There have been a couple of plans to put a new tenant in there, but a lot of rennovation work is required, and the maintenance on that place would be enormous, so the Mayor has not been able to find a new company to occupy the building. Thank goodness someone is trying to save Superman in the meantime. 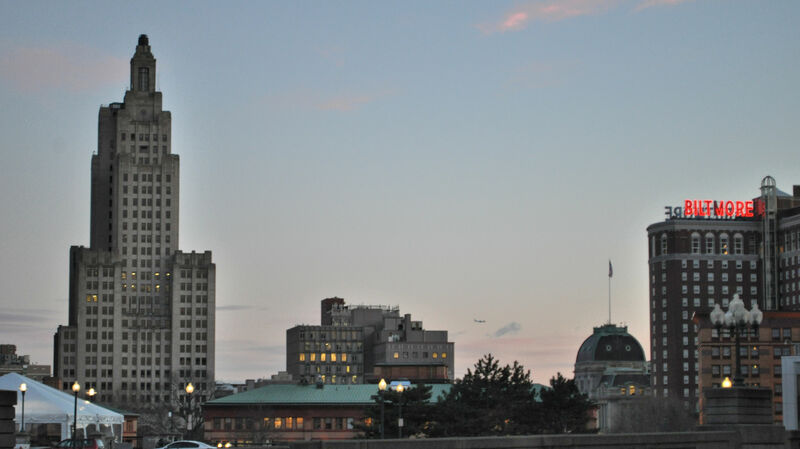 Superman Building and the Biltmore – two historic and iconic Providence buildings. 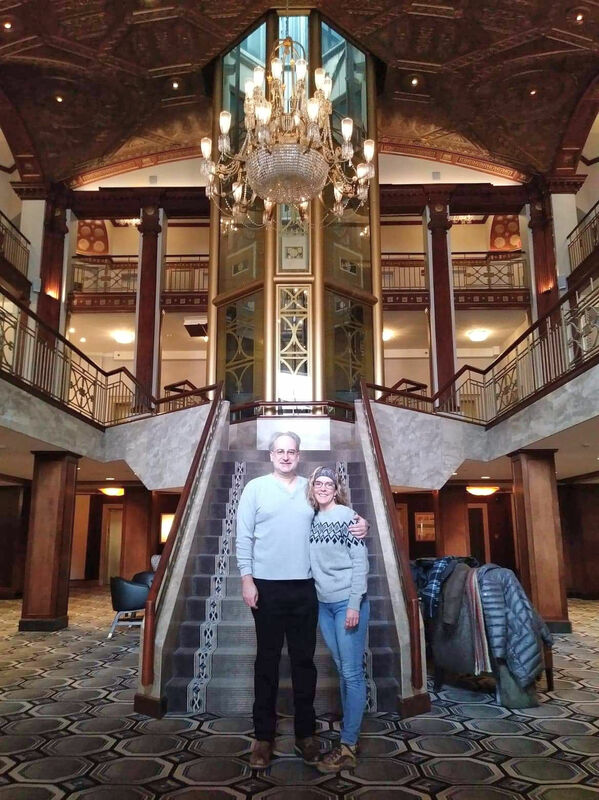 Will and me inside the beautiful Biltmore Hotel, our winter weather gear heaped on a chair. I’ve mentioned the Biltmore Hotel in earlier posts and haven’t talked much more about it because I managed to forget to take photos inside. We were usually on our way to do something fun and I didn’t want to stop for photos in the hotel, or on our way back from something fun and I was too tired. I managed to get two pictures that help you get a sense of how wonderful it is inside. 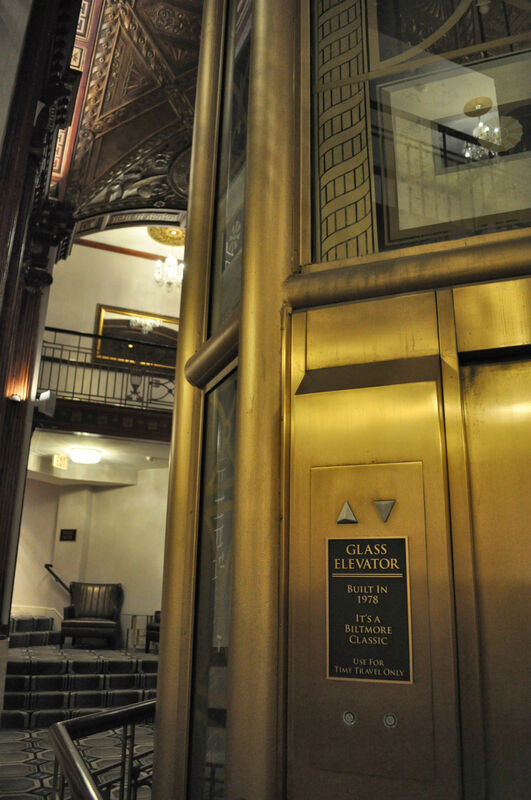 At the top of the staircase is a neat old glass elevator that is no longer in use by guests, but Will recalls from his younger days that it was fun to try and sneak onto the elevator for a ride and a view of the city. Providence downtown, the morning that I left. Then we went to the airport and I remembered to thank the TSA personnel for working with no pay because of the government shut down. Providence has a small airport like Portland’s, and checking in was a breeze. Soon I was in my seat. I always want a window seat. 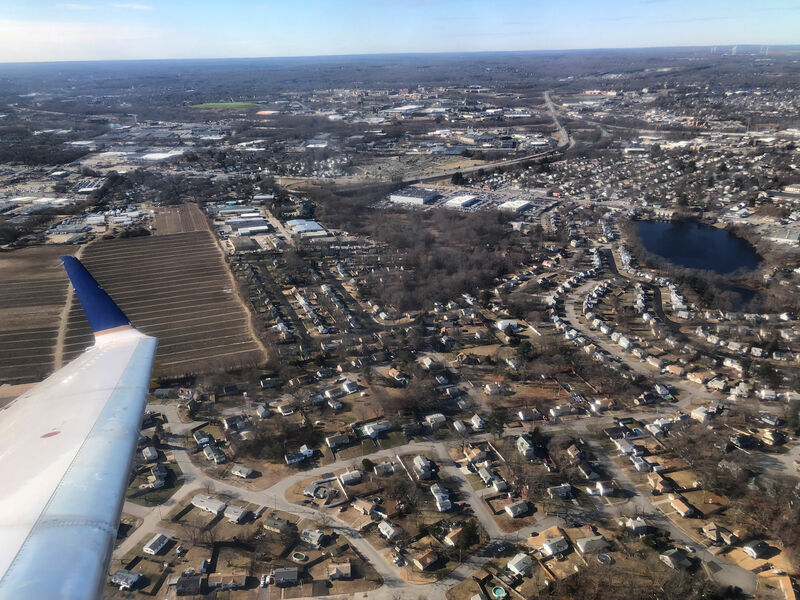 I was in my first airplane at about age 8 and I’ve been flying commercial since age 16, and yet I still get a thrill when I’m in the air. 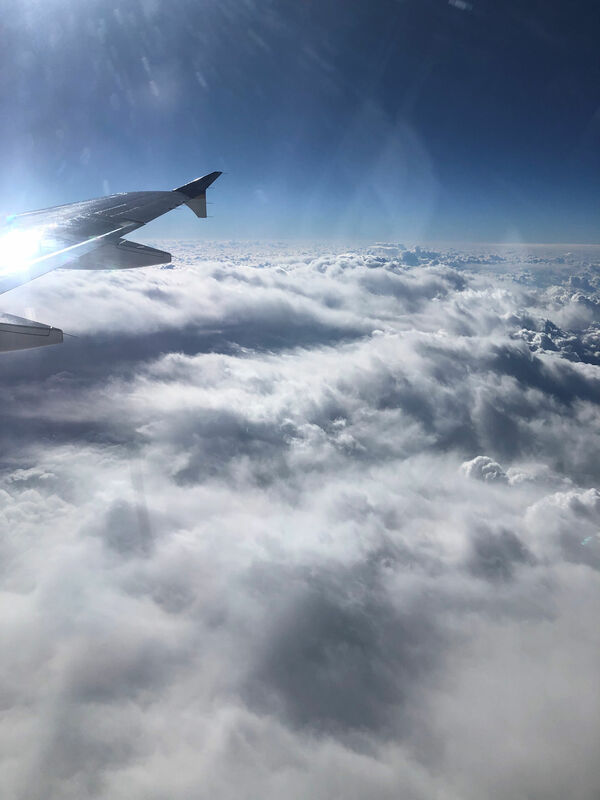 With a background in meteorology, I marvel at the up-close look at clouds. 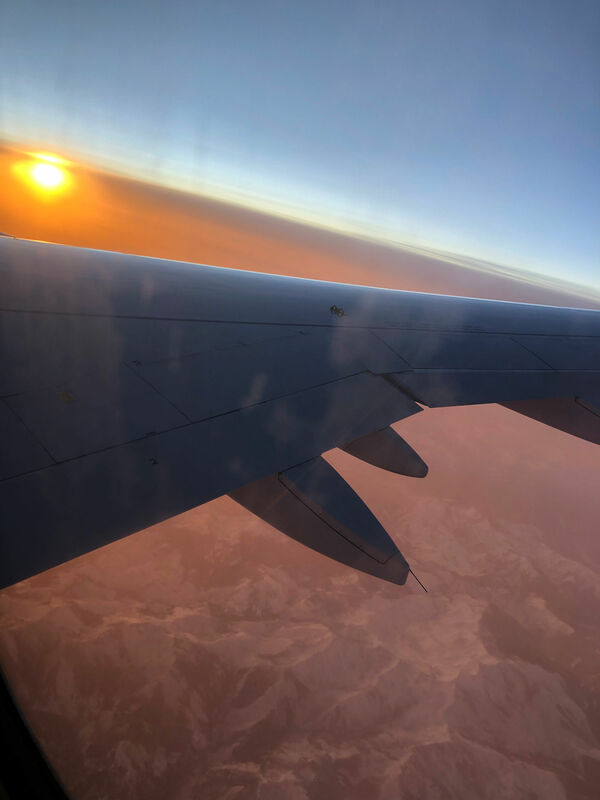 With an unquenchable yearning for new sights, I spend all the time I can with my face pressed up against the safety plexiglass, peering through the frost patterns, in speechless awe at the planet below. My flight at the beginning of the trip from Portland to Newark. 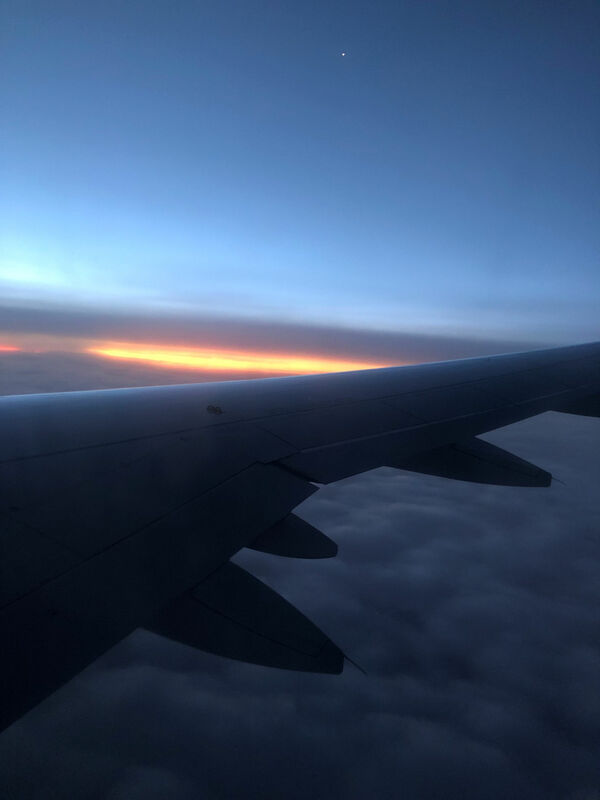 We took off in darkness, then flew into the sunrise. It was so wonderful. See the star? Although, it’s so big and bright it might be a planet. Bumping along the updrafts above the clouds. Orange morning illuminates snowy peaks. 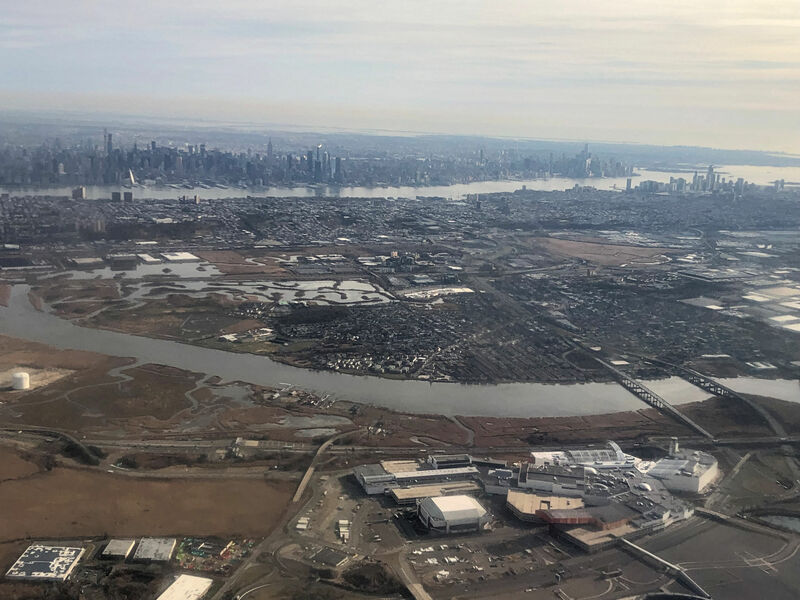 The day I left, our tiny plane flew low from Providence to Newark, so it was easier to watch life on the ground. On approach, I realized Newark must be close to a larger city. Yep. “THE” larger city. 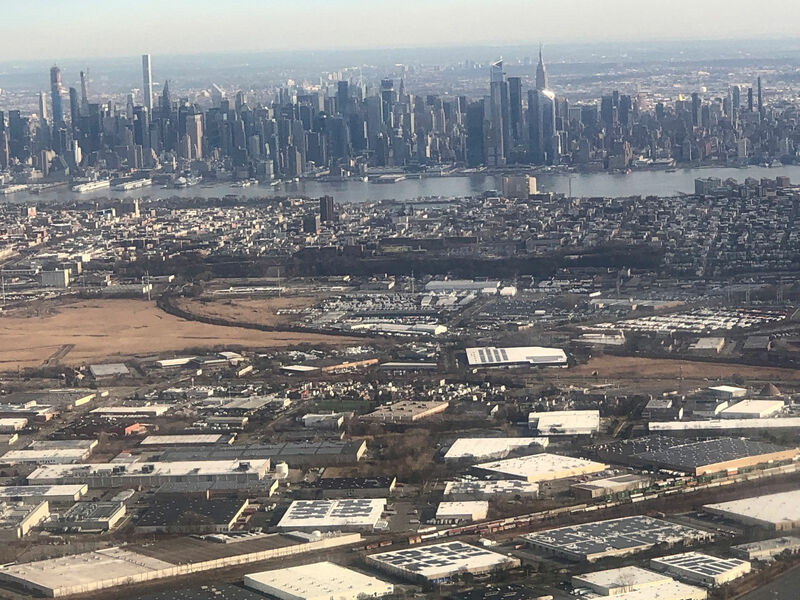 I had fun looking down onto New York City as my plane landed. 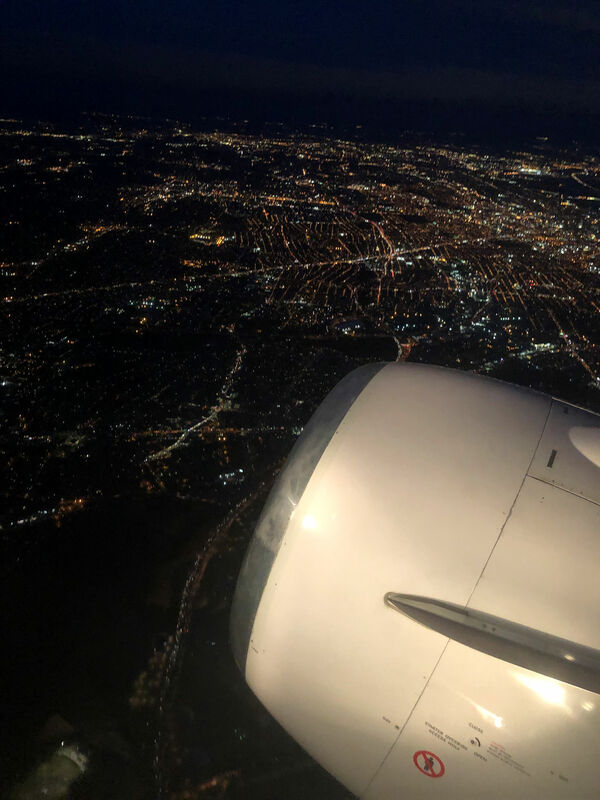 After a long layover in Newark, we left for home in the dark. Goobye New England. I’ll be back!